Saturday night’s World Cup quarter-final with Croatia will have been the third straight game at the competition for Russia to wear their white change kit. The ‘proper’ format for the strip is blue shorts and red socks, but due to what the opposition have been wearing, all-white has been the only combination used on the field (the red socks were oddly worn with the home shirts and shorts against Egypt in the group stage). 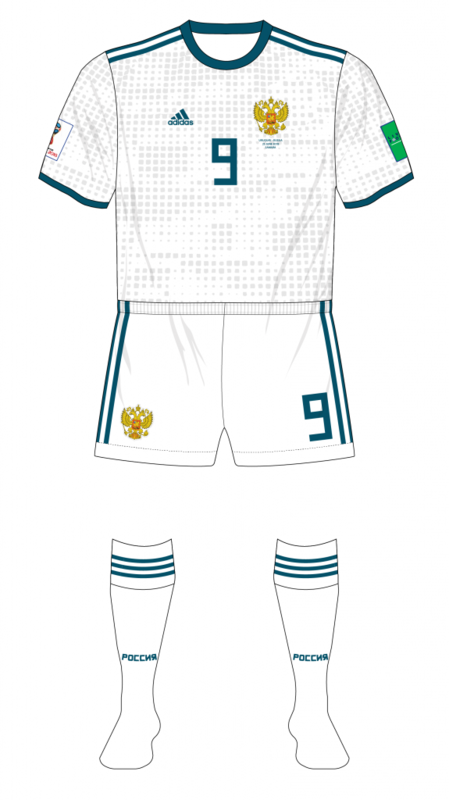 Host nations wearing a change kit at the World Cup is not a new phenomenon, though Russia are the first to have worn a second-choice shirt since 2002. Here, we will look at the other instances. 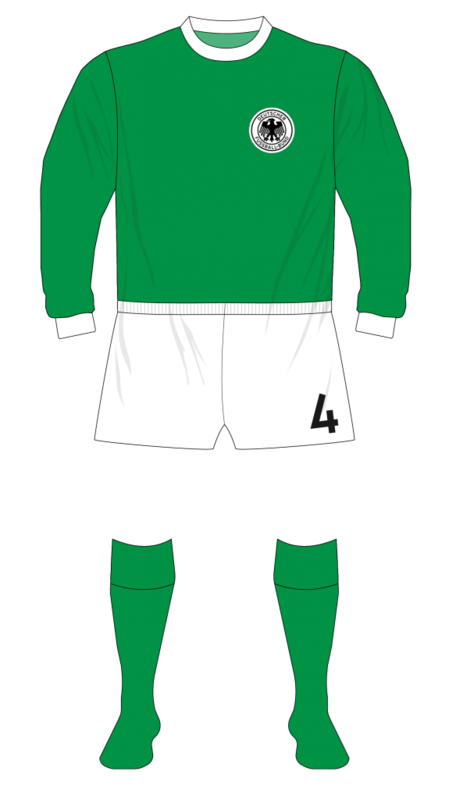 Perhaps surprisingly, given that home teams often changed in ‘normal’ games at the time, it took until the seventh World Cup, 1962, for a host team to wear a change kit. 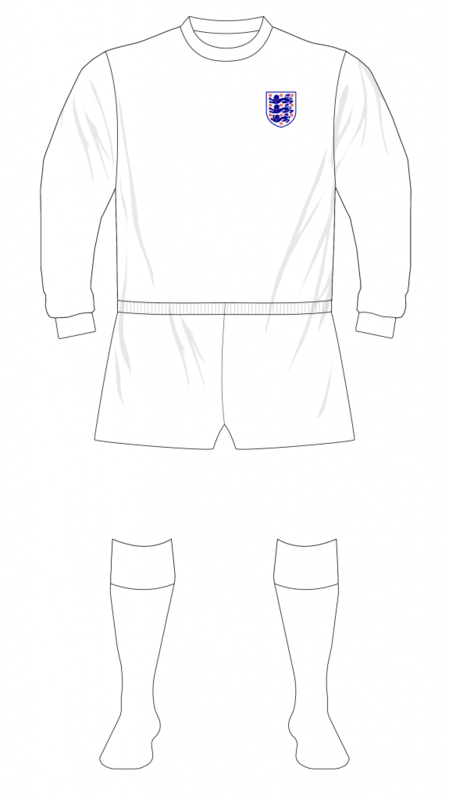 The 1930 final meeting of hosts Uruguay and Argentina would be considered a kit-clash nowadays, but both countries wore their normal kits. Eight years later, Italy would famously wear all-black when they met home country France in their quarter-final tie. EDIT: The black line on the Chile jerseys in 62 was in honour of Carlos Dittborn who died the previous month. Thank you Paul ! Four years later, England would undergo two changes to their kit as they claimed the cup. 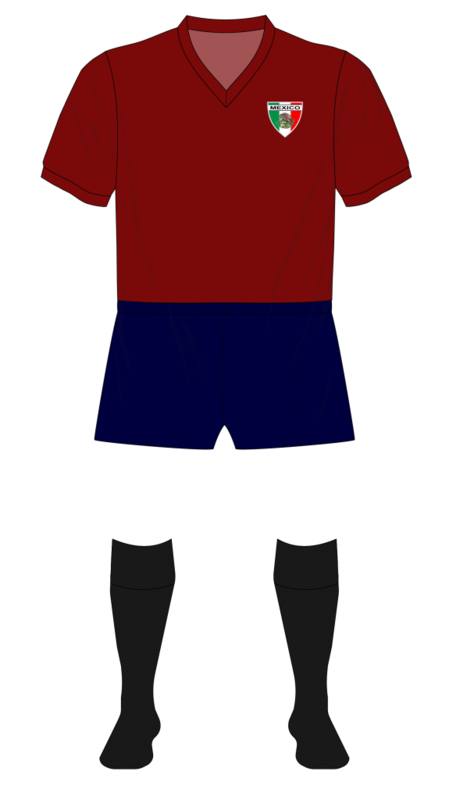 Fifa had taken to mandating teams in the competition to wear different-coloured shorts as well as shirts – for example, Italy wore navy shorts with their blue shirts in their defeat to North Korea – and so for the quarter-final with Argentina at Wembley, Alf Ramsay’s men were in all-white. 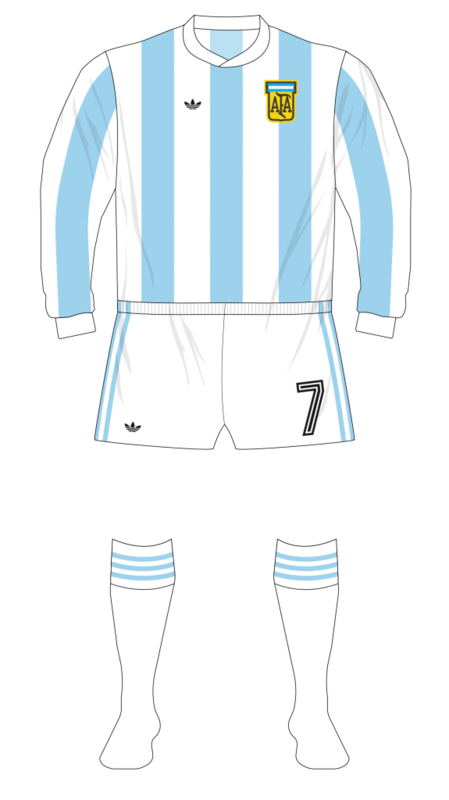 Presumably, it was felt that it made more sense rather than Argentina, with a darker kit overall, adding more white to theirs. England won 1-0 – Ramsay was reported to have compared the Argentinians to animals – and then saw off Portugal in the semi-final to set up a meeting with West Germany. 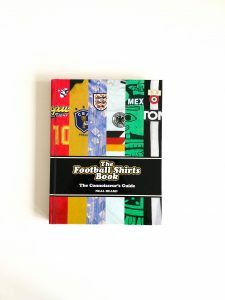 When a colour-clash occurred in the 1958 final between Sweden and Brazil, it was the away team who had to change – Brazil bought blue shirts in a sports shop and that has remained their alternative colour ever since – but here England lost the toss. It was the first time since the game against the USA in 1950 that England would need to wear shirts other than white at the World Cup. 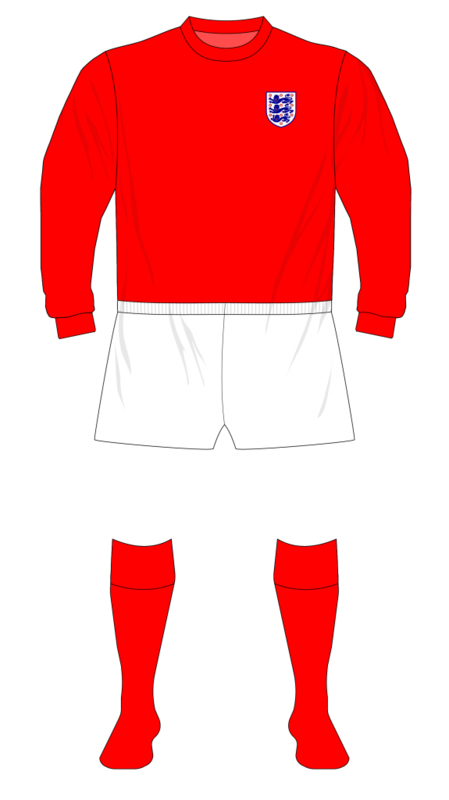 Defeat in that game in Brazil had seen blue away kits banished, to be replaced by red and that is of course what they wore as Geoff Hurst’s hat-trick helped them to a 4-2 extra-time win. 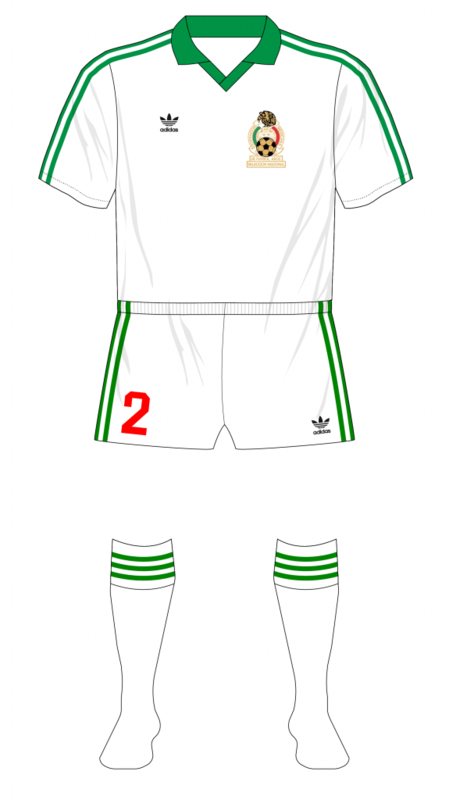 Four years later, Mexico would twice wear their change kit, though both times because of shorts clashes rather than meeting a team in green. Belgium had opted to wear all-white at the competition and, against both them and Italy in the quarter-finals, the hosts turned out in burgundy shirts with navy shirts – the teams’s original look before switching to the national colours of green, white and red. 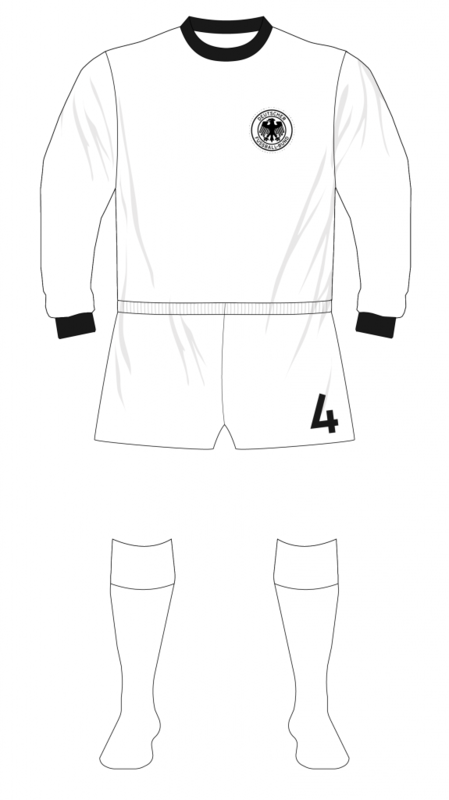 As with England in 1966, West Germany would win as hosts in 1974 and they would also wear change shorts as well as change shirts. Against Australia in the opening group stage and Sweden in the second group stage, they wore green shirts and white shorts – there is an urban myth here in Ireland that the colours were chosen as a mark of respect as Ireland were the first country to play them after World War II, but like so many others, it’s false – and then against the all-red of Poland, the hosts were in all-white. For the final, they were back in their traditional white-black-white as they beat the Netherlands 2-1. 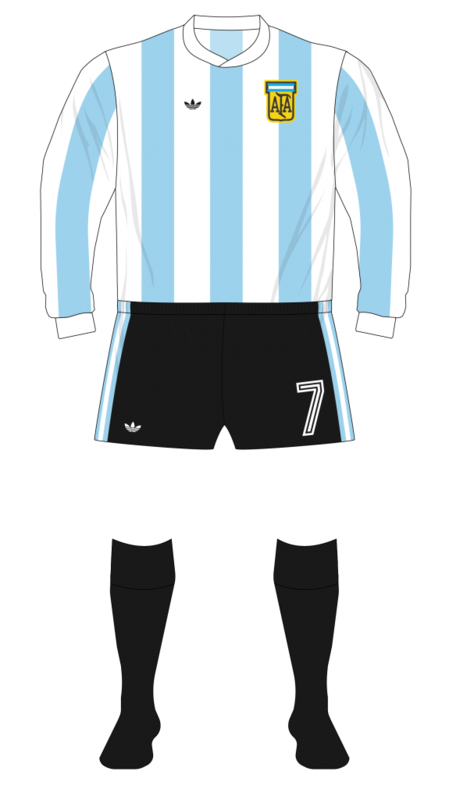 Argentina would continue the trend of victorious hosts in 1978 – also beating the Netherlands 2-1 in the final – but, unlike England and West Germany, they would wear their famous sky-blue and white stripes in each game. However, they did change below the waist. 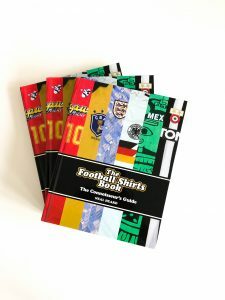 Having gone through their opening group in their first-choice kit of striped shirts, black shorts and white socks, in the second group they wore white shorts and socks against Poland and then black shorts and socks against Brazil and Peru. Like West Germany, they were ‘properly’ clad in the final. Spain in 1982 didn’t have to change at all, but Mexico – hosting again in 1986 after original choice Colombia was unable to do so – did so twice. 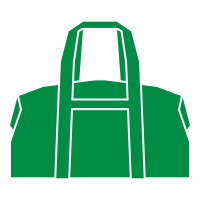 By this time, they had opted to move away from burgundy change shirts and were in all-white as they beat Paraguay in the group stage and Bulgaria in the last 16. 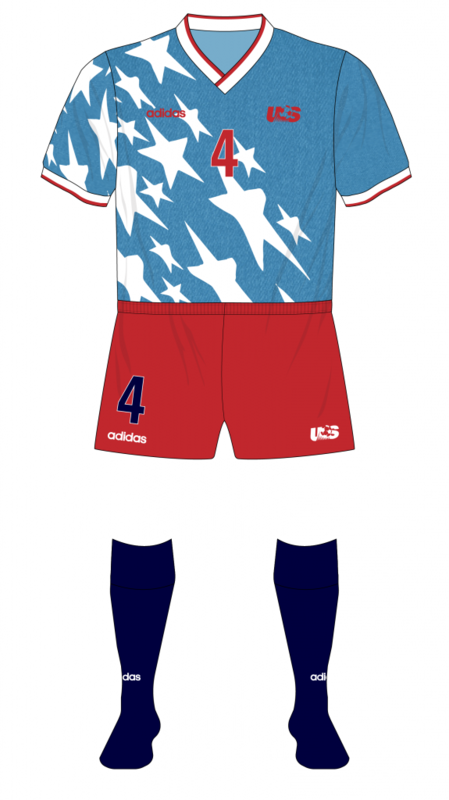 Like Spain, Italy wouldn’t need any alternative kit as they finished third at their World Cup, but we can say for certain that the USA did wear their change strip in 1994. What we can’t say is which was which, though. Having worn white home shirts trimmed with blue for the previous decade, the US were in patriotic garb as both kits represented their flag – one was red and white stripes, the other was a denim blue with white stripes. Logically, one would have thought the red and white would be the home, but they wore the blue shirt in each of their three group games – the fact that Switzerland wore white against them would seem to indicate that the US were the home team. 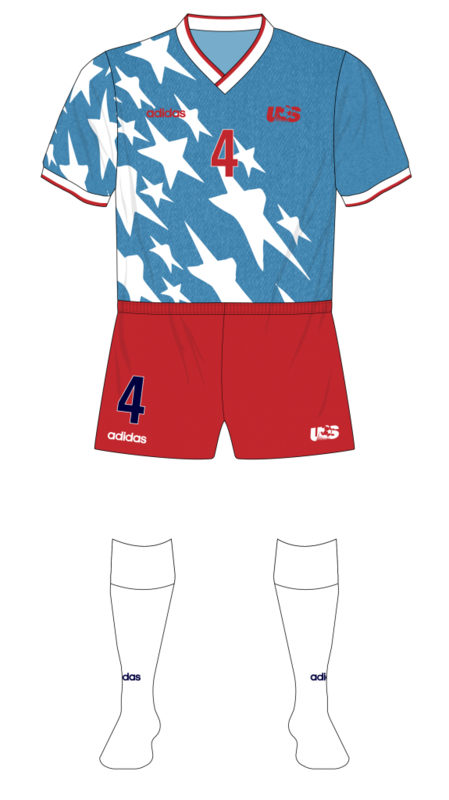 Oddly, three different types of socks were used: plain navy with an adidas wordmark against the Swiss, white socks against Colombia and then navy with three adidas stripes and an anachronistic trefoil logo in the final game against Romania. 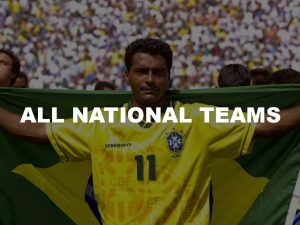 Those latter two opponents wore yellow shirts and there were no problems with the USA wearing blue against them, so you would have expected the same to happen when Brazil provided the opposition in the last 16. This time, though, the stripes were worn, with the same red shorts and trefoil socks, as the hosts exited on a 1-0 scoreline. 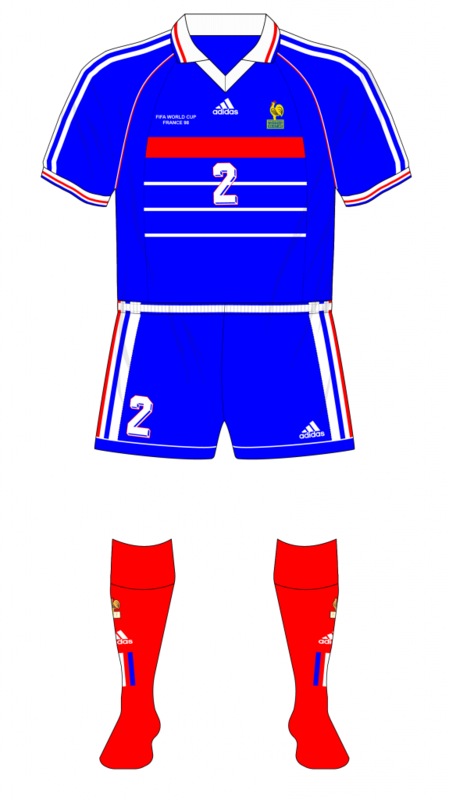 It was easier to ascertain which was the first kit and which the second for France in 1998 as they wore their traditional blue shirts for six of their seven games en route to victory. 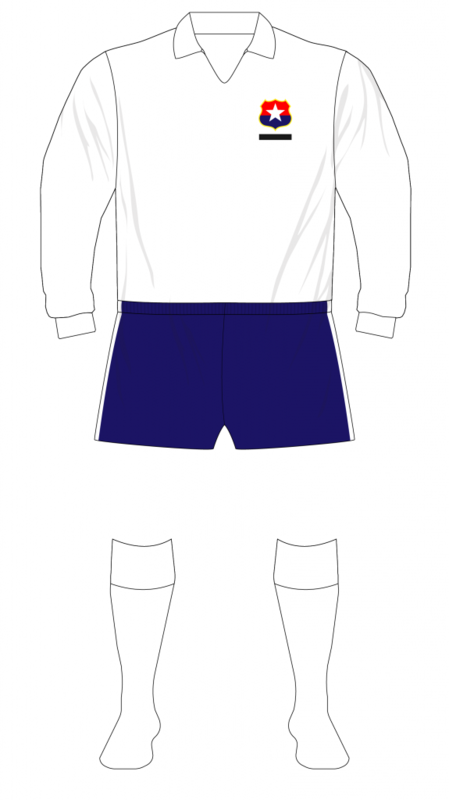 The exception was the quarter-final penalty shootout win over Italy – in an early example of something which would become prevalent, Fifa preferred to avoid blue-white-blue against white-blue-white and so Italy wore all-blue with France in all-white, wearing the home shorts with away shirts and socks. 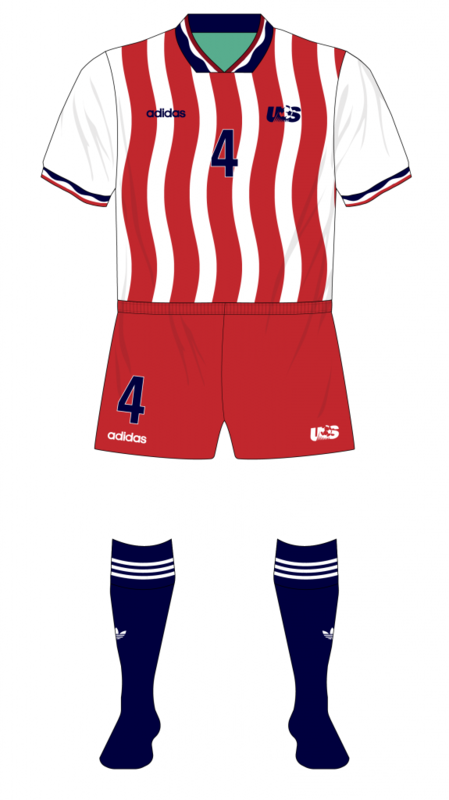 The next game was the semi-final against Croatia, whose red and white checks, white shorts and blue socks can often prove troublesome for those deciding which kits should be worn. 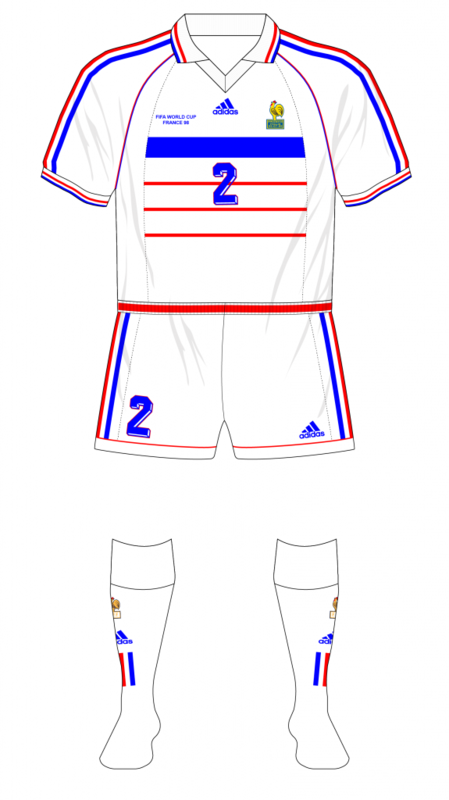 The compromise reached for the last-four tie was that France would wear their away shorts, with Croatia switching to white socks. While Croatia went ahead, the only two goals of Lilian Thuram’s 142-game international career ensured France progressed to the final, where they would beat Brazil 3-0. For the first time, the 2002 competition provided dual hosts, Japan and South Korea. 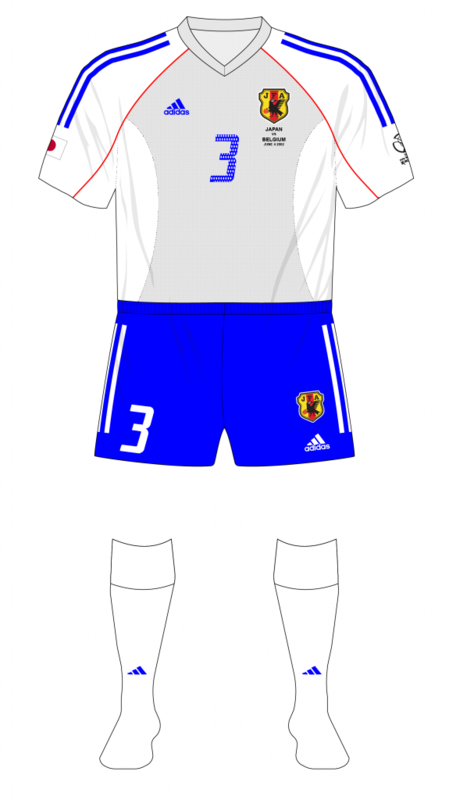 While Japan normally had white reversals of their blue home shirts, this time their away was grey with white sleeves and they wore it in their first game, a 2-2 draw with Belgium. They were back in blue for the remainder of their matches, going out against Turkey in the last 16. Their co-hosts South Korea would end up making it to the semi-finals. 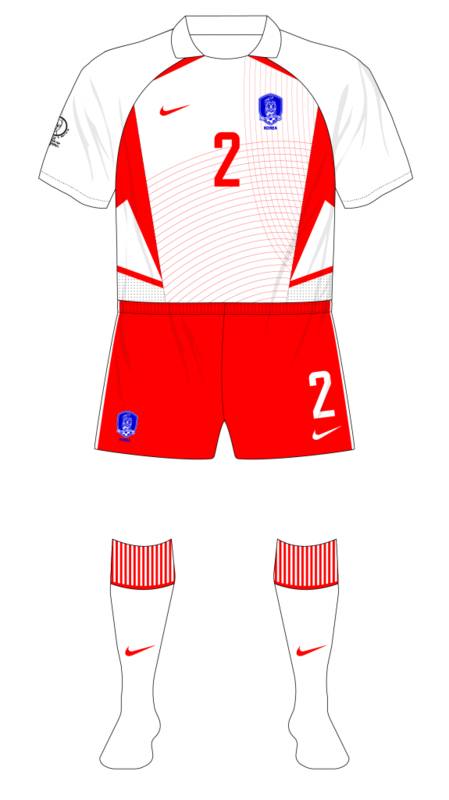 Having switched to white home kits for a time in the 1990s, they were back in red by this stage and wore that against Poland and the USA in the group stage before wearing their white away against Portugal. A 1-0 win in that game sent them through to a second-round tie with Italy. Again in white, they won with a golden goal and they were also in their change kit when seeing off Spain in the quarter-finals. Even if they had wanted to keep the white as a lucky charm, they had no option but to revert to red for the semi-final against Germany, when 1-0 defeat ended their journey. Germany would be the next hosts but neither they nor South Africa in 2010 have to deviate from their first-choice kits. Brazil in 2014 were able to wear yellow shirts all through, but they did have to change shorts quite a bit. 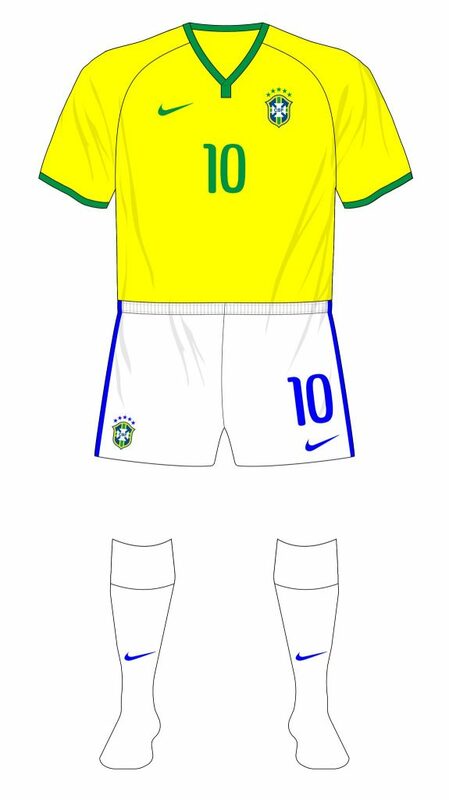 Apparently, Fifa had wanted Brazil in yellow shirts, white shorts and white socks for the opening game against Croatia, who would have worn all-blue, but the hosts made a special request and the game went off without a hitch with blue in their traditional kits. Brazil also wore their normal kit against Mexico, who changed to red and black, but for the last group match against Cameroon, Chile in the last 16 and Colombia in the quarter-finals, white shorts were used. While they were back in blue shorts for the semi against Germany, they might have wished they’d stuck with white as a 7-1 defeat ensued. To be fair, the absence of Neymar was probably more debilitating than what colour shorts they wore as, in the third-place play-off against the all-navy-clad Netherlands, they wore yellow-white-white and lost 3-0.